When I got to meet Katie and Gwen I had no idea how much they were going to change my life! I knew about veganism and I always wanted to give it a try, but always failed. They taught me so much about nutrition & health.. and actually after the first long conversation I went vegan overnight and it was the best decision ever!! Shortly after I was able to run again (had lots of foot pain til then) ! With a plant-based nutrition my inflammation dissappeared which made running daily possible again! Also I had waaaay more energy eating this way!! Then they made a running plan for me and 3 months later I did my first ultra trail race with Katie Thank you so much for everything!! Our mission is to inspire people to make positive changes in their life that will ultimately benefit our planet. Katie and Gwen, young plant-based adventurers, are taking on endurance challenges all around the world that require to push the limits of what is physically and mentally possible to inspire people to plant-positive change! Through their adventures, they document every part of it, from the preparation/planning to the realisation of it. A media crew captures their journey, and the documentaries / short films made are screened through social media and social events in North America, Europe and Australia, and reach thousands of people. Their core value is to inspire people to see a plant-based diet differently. A plant-based diet can benefit the planet is many ways, as well as our very own health, and animal welfare. Katie and Gwen found mastery in their vegan lifestyle and share their experience in order benefit the planet, the animals and all of us living on it. Katie and Gwen have inspired many people to adopt a plant-based diet, planting positive change, one individual at a time. The positive impact on the planet is considerable. Everyday each person that chooses to change their eating habits to plant-based saves 1,100 gallons of water, 45 pounds of grain, 30 square feet of forest land, 20 pounds of CO2 equivalent and one animal’s life, EVERYDAY! The ripple effect of this is huge, every person who has changed thanks to the inspiration of Katie and Gwen have a significant positive impact on their family and social circle! Even inspiring people to drop just one serving of animal products from their diet per week saves the same amount of CO2 emissions as removing 500,000 cars from the road! Katie and Gwen are empowering people to make the world a better place, planting positive change one seed at a time! Our goal is to inspire 10,000 people to adopt a plant-based diet even if that takes to reach out to 1,000,000 people. When we accomplish our goal, we will save EVERYDAY the equivalent of 11,000,000 gallons of water, 45,000 pounds of grain, 300,000 square feet of forest land, 200,000 pounds of CO2 and 10,000 animal’s life. EVERYDAY! Believe it or not, I have not always been this happy and healthy. I grew up in North Idaho, participated in sports, did well in school, but was very confused and lost within. I always knew that I wanted to help animals and others but I just didn’t know how. I became vegetarian at age 7, which turned out to be a very unhealthy diet for me because I was consuming so much dairy to supplement the meat that I was not eating. This vegetarian diet high in saturated fat from lots of cheese caused me to gain a layer of fat around my tummy, it cased very bad acne that I struggled with for years, it weakened my immune system and I caught every cold and flu that came my way, and it left me feeling unsatisfied with my body and mind. Ultimately this lead to heavy drinking, partying and a horrible phase of my life where I treated my body and mind so poorly. I was not happy with who I was, and so I masked it with alcohol and comfort food. Then something changed. I was pretty much at rock bottom when I learned of Sea Shepherd Conservation Society and how they send ships with volunteer crew down to Antarctica to stop the illegal Japanese Whaling Fleet from killing whales. A flame was ignited deep within and I knew I had found my true calling. I dropped everything that I was doing in my life to actively pursue a crewing position on their ships. My persistence, passion and dedication paid off and I was offered a position on one of the Sea Shepherd Ships. This was the experience that started my journey to ultimate health and fitness. The ships are 100% vegan, and so I became vegan, which was just what I needed. I found myself excited to learn about everything behind the vegan diet, from compassion to nutrition and I wanted to know more. I met Gwen on board the ship and we got together quickly due to our passion for protecting our environment, our love of animals, health and fitness. We traveled from Australia, New Zealand, Antarctica, France, to Africa together, adventuring as vegan fitness lovers. We couldn’t get enough and so we decided to take our education and life to the next level, so we decided to become Holistic Sports Nutritionists. We studied Plant-Based sports nutrition together and we loved every minute of it. We were not done, we wanted to know more, we wanted to experience more and we wanted to help more people and animals. I decided that I wanted to be a yoga instructor, a group fitness instructor, and a lifestyle and health coach. So I took all the steps necessary to do this. This was made fun and exciting because Gwen was moving along the same path, and he became a running coach and then a tennis coach. We want to do it all, and we want to have more and more fun every day. I have been with Sea Shepherd ever since, taking breaks from living on the ship to travel and experience life off the ship. I know that by health coaching, I can not only help other people find happiness in the life they live through nutrition and life coaching, but that I can help animals at the same time. Being a vegan to me is the most rewarding thing ever, it is so spiritually delightful and peaceful, it nourishes my body and mind in perfect harmony and it allows the animals and planet to undergo the least possible impact by my existence. I have taken on some pretty big goals and accomplishments with my fitness since I have started this health and fitness journey! I ran my first race ever in France July 2013, and it was a 36 mile Ultra-Marathon through trails along the ocean near Gwen’s home town! I have began running half marathons and have done very well! I am now training for my first 50 mile trail ultra! Favorite sports: Trail Running, Surfing, Stand Up Paddle, Hiking, Everything else outside! Gwen doing a backflip on his kitesurf in Kailua Bay, Hawaii. Gwen has always been doing everything 100%, with a goal of helping other and making the world a better place! It started back in high school, when Gwen enrolled with the firefighters of his town. For 2 and a half years, Gwen was giving all of his free time to help his community. Later, Gwen decided to join the military police to try to protect his community and bring some justice. Doing very good during the military classes, he was able to join a special unit where they trained intensively everyday to be ready to deal with any situation. But with a lot of ambition, he started dreaming bigger, dreaming about a bigger fight, and that’s when he found Sea Shepherd, the most active conservation organisation in the world. To be able to join the crew, Gwen went to Marine Engineering school for 4 years. 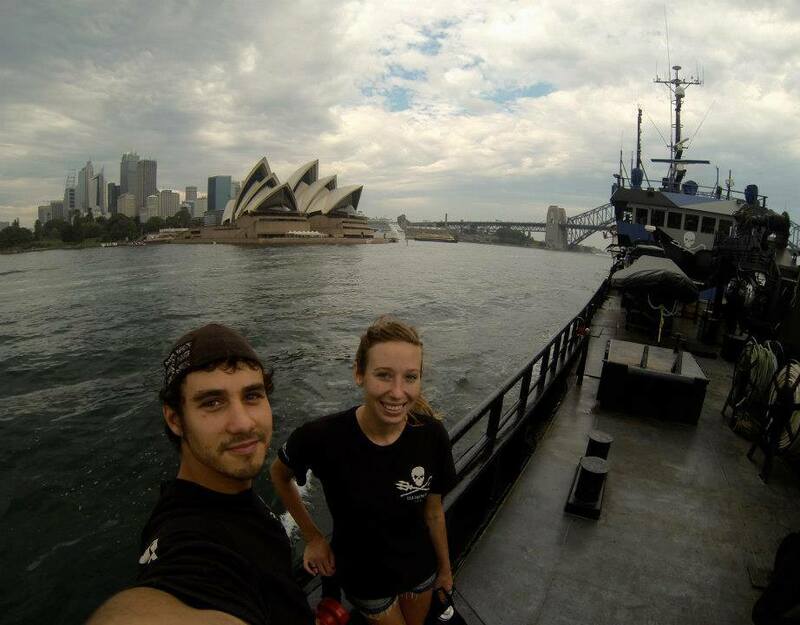 As a marine engineer, Gwen got selected immediately to join the crew of the Bob Barker, one of Sea Shepherd’s ship. Good things kept happening, Katie arrived in his life, and a few months later one of the most successful Antarctica campaign where 932 whales have been saved, thanks to one of the most intense confrontation with the illegal whalers. His love for sports and health called him back. After 4 years fighting for the oceans, Gwen went back to school and studied Sports Nutrition at the University of Natural Health. As you could guess, Gwen being everywhere, he also got certified running coach (RRCA) and tennis coach (USPTA Elite). During the 2015/2016 season, Gwen has been coaching some of the best junior players in the world at the academy Sanchez-Casal in Naples, Florida. Now Gwen is thriving on a plant-based diet, competing in diverse endurance sports. If you have any fitness/nutrition question, he is the man! WHAT CAN HEALTHY FIT NUTRITION COACHING DO FOR YOU? You will find the confidence and knowledge to transform your life and reach your goals! We will show you how to eat in a way that truly nourishes your body from the inside out! You will feel great and never want to go back to your old habits! Personalized meal plans, shopping lists, and nutrition guidance so you never again have to wonder if something is healthy or not, you will know! Learn from us about our adventures around the world with non profit organization Sea Shepherd Conservation Society! We will teach you how to go for your dreams and how to reach them! You can't be truly happy until you find your passion! Do you care about the environment and want to do all you can to help protect it? We will show you how to live a life that is in harmony with our environment. Has your doctor told you that you need to watch your cholesterol, sodium or fat intake? To watch your diet? But you just don’t know what that means or how to go about doing it? We will show you how easy, enjoyable and delicious it can be to get healthy the right way! YOU CAN AND YOU WILL LIVE VIBRANTLY, HAPPILY, HEALTHily AND REACH YOUR GOALS, ALL YOU NEED IS A LITTLE COACHING FROM US! Are you overwhelmed and exhausted all the time and find yourself always looking to caffeine and sugar to get you through the day? We can show you the proper foods to eat which give you energy while nourishing your body from the inside out! Get our guide now, it will change your life!